Decorating With Art: Glitterfest Gone Ghoulish! Check out what's for sale at LoriGutierrezArt.Etsy.Com! Fall Glitterfest was absolutely to die for!! :0) Ghostly ghastly ghouls, zombies, witches and creatures of the night -- and those weren't just the people walking around! So much talent, so many truly great artists under one roof -- it was a smashing success! Diane and Sheryl totally outdid themselves! Thanks so much to those two for all their hard work in putting together a frightfully fabulous show! Here's a few photos of some of the pieces I did for this show -- it definitely was a departure from my normal work and brought out a little darker side to my art. But so much fun and I can't wait til next year!! I absolutely LOVE my necklace! Thank you! Thank you! And tell that Cindy girl see better be there too next year! 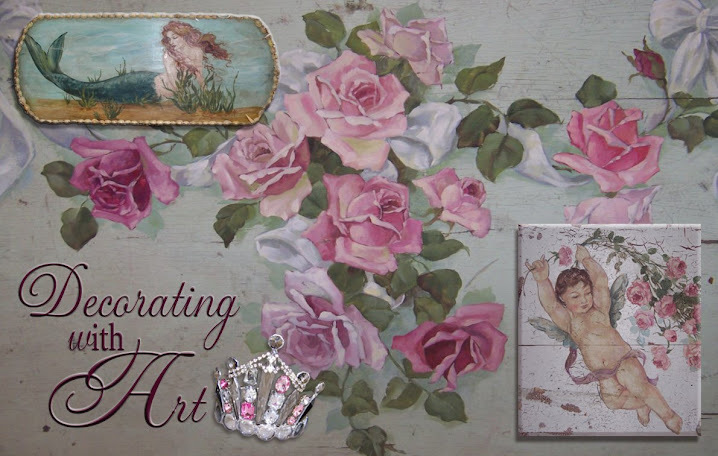 Welcome to Decorating With Art -- the official Lori Gutierrez blog! Bringing you an artist's eye view of the world, I want to show how you can find beauty, charm, and style - the usual and the unusual - in everyday life. Anything and everything you see, even those things you don't even notice, has potential to become artwork. Life brings subjects and models for creativity, every moment, every day. Read my blog to learn how to find them, and more about my passion, my love, my life - art! Take a look at what I have for sale at LoriGutierrezArt.Etsy.com. Please remember that all artwork depicted on this site is copyrighted by Lori Gutierrez. Any unauthorized use without the written consent of the artist is prohibited and will be litigated. One of my favorite subjects without a doubt -- she is so full of beauty and grace.